There's no way to miss this year's Tampa retro uniform, first worn June 30 against Detroit. 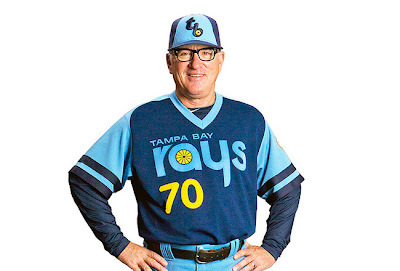 Joe Madden could stop some traffic in that mix of cool colors and splash of yellow. The powdery blue in Tampa's uni swept me back to Seattle's own 70s blue-and-gold look, echoed in farm teams like Spokane and modeled on cardboard by Rodney Craig. Seattle signed Craig as a free agent soon after their 1977 debut. He played in the Kingdome for parts of three seasons, but ultimately moved on to another team of Indians, the MLB version in Cleveland. I sifted through Rodney's stats for interesting performances and found one of baseball's unusual traditions, the suspended-and-resumed game. On June 9, Cleveland and Detroit played a twi-night doubleheader and the second game--which started at 9:26--stretched into the 15th and past 2AM before umpires stopped the proceedings. Craig pinch-hit for Jack Perconte (another ex-Mariner) in the 9th and remained in the outfield until its suspension. His double in the 14th gave Cleveland a great chance to win, but two ground outs got Detroit out of the jam. When the game resumed three months later, Craig no longer saw regular duty, so rookie Carmelo Castillo replaced him in the outfield. The game itself ended in 18 innings with an anti-climax. Detroit loaded the bases on a walk, single, and error against Bud Anderson. Incoming reliever Ed Glynn sent his first pitch to the backstop and Alan Trammell scooted home with Detroit's winning run. According to Baseball-Reference, it was the longest game ever to end on a wild pitch. 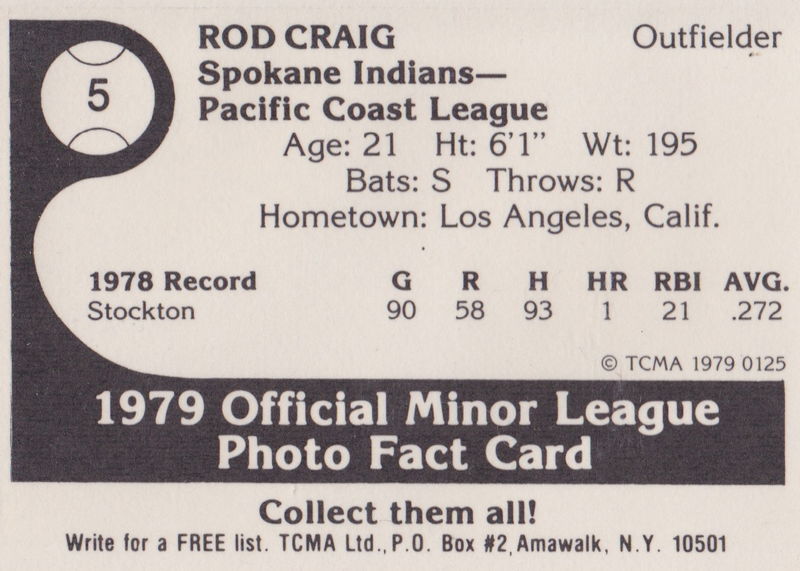 Craig moved to Mexico after his MLB career ended and returned for a handful of single-A California League games in 1990 (career stats). That team (the Salinas Spurs) fielded several Japanese players and were managed by Hidehiko Koga, so probably allied itself to a local immigrant fan base. Spokane's TCMA checklist includes 24 players and then-manager Rene Lachemann. As Seattle's AAA affiliate, most of this roster played on the Kingdome's Astroturf and both Lachemann and Bill Plummer went on the helm the Mariners. 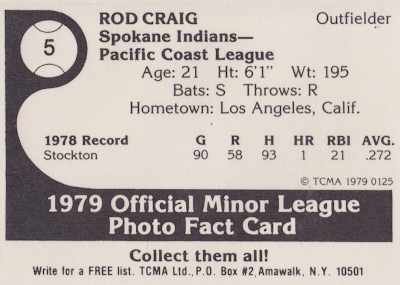 Value: This #5 cost $2 at MinorLeagueSingles.com, where I picked up most of my late-70s minor league cards. Rodney's teammates run about the same and team sets top out at $20-30. 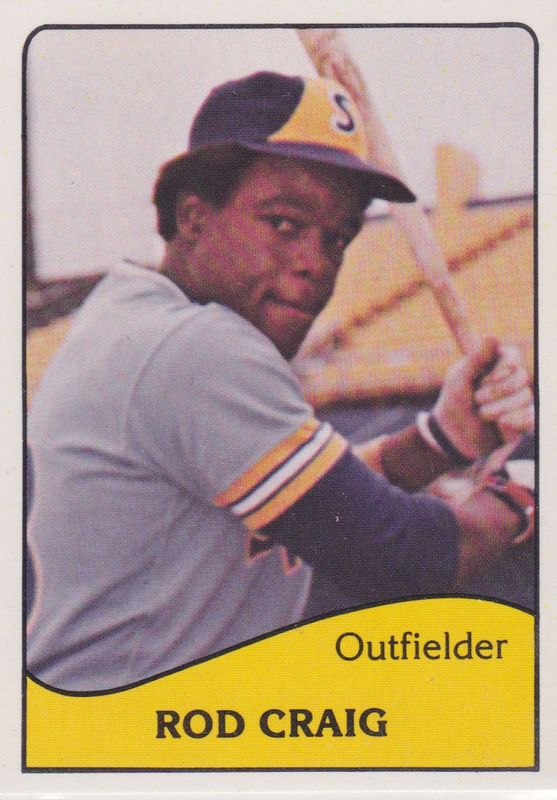 Fakes / reprints: TCMA reprinted several 1980 team sets for collectors kits in the late 1980s, but haven't seen any 1979 reprints in the marketplace.